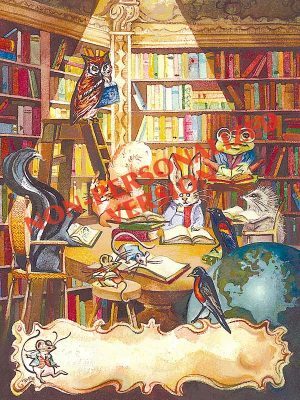 This bestselling design, a painting of animal characters in a library, by Antioch Bookplate Company artist Tom Till, was inspired by the illustrations of Beatrix Potter. This version is available only with no text added. If you would like to have a name printed, please see our personalized version. This design is 4 inches high and 3 inches wide. It has been printed on white, non-glossy, self-adhesive paper with a peel-off backing. The paper, adhesive, and ink are archival quality and acid-free.